Bus from Johor Bahru to Temerloh is the most reliable and convenient way to travel from Johor Bahru to Temerloh. Residents in Temerloh rely on this bus service due to no train or flight service available between Johor Bahru and Temerloh. Bus from Johor Bahru to Temerloh is the top favourite for Malaysian who stays and works in Johor Bahru and Singapore. 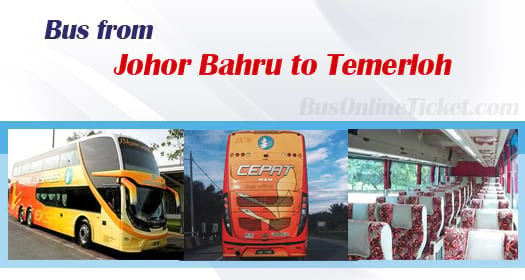 Cepat Express is the only bus service operator providing bus from Johor Bahru to Temerloh. Cepat Express is a reputable express bus company in Malaysia by providing excellent quality and reliable bus service. Cepat Express providing up to 3 daily departures from Johor Bahru to Temerloh. The first bus service is starts in the morning 8:30am. The following bus schedules are 2:00pm and 4:30pm. The bus operating at 2:00pm is VIP coach with more spacious seat as compared to the other 2 timings of 40-seater coach. The estimated travel time from Johor Bahru to Temerloh is about 5 hours depending on the road traffic condition. At least one stopover will be given during the journey. All the passenger can grab a bite to eat or go for washroom break during stopover. The boarding point in Johor Bahru is located at Larkin Bus Terminal. Larkin Bus Terminal is the largest bus terminal in Johor Bahru which can be easily access via city bus and taxi. The arrival point in Temerloh is located at Temerloh Bus Terminal. The bus ticket from Johor Bahru to Temerloh is reasonably prices at RM 31.70 for adult and RM 23.80 for child. BusOnlineTicket.com to be one of the most reliable and reputed online booking portal throughout these years. Online booking in BusOnlineTicket.com is simple and convenient. Book your bus ticket from Johor Bahru to Temerloh now at BusOnlineTicket.com to secure your seat before travelling.